There is nothing like hitting the road for a new adventure. If you have a passion for travel and the great outdoors like us, your adventurous life doesn’t have to end when you have kids… you just need to alter your approach slightly and embrace the new exciting journey as a family. By changing pace and slowing down we have enjoyed some amazing adventures together, connecting with nature and sharing all its wonders with our little ones. As a young travelling family we are always meeting new people. One of the first comments we receive on the road is how crazy we are travelling with such young children and this is closely followed by “how do you do it”? Obviously travelling with our mini humans is harder than solo travel or travelling as a couple, and we have had our moments of ‘get me out of here’, but all the special moments we share together always outweighs those few moments, or stressful events. We wanted to share with you a little summary of tidbits that we have learned along the way while travelling with our mini blondies who are currently 2.5 years and 13 weeks old. Let us start with the looooooong car trips. These can be a killer and it is so easy for everyone to be stressed out even before your adventure has begun. We pack loads of snacks, books, stickers and toys – making sure there are some new and different items in there too, AND as much as we said we would never do it, a car dvd player or iPad for the toddler/s. For some strange reason (wink wink) our car dvd player needs its batteries charged before you can watch it, well this is what is told to our toddler. So Marli has to spend a good amount of time playing with all her other toys and books etc before she can have some screen time. Those pesky batteries always seem to be charged after our lunch stop, or when we really need to get some Km’s under our belt. Travelling with a little newborn is a bit easier (most of the time!) as long as the little ones like the car. We are blessed with a happy boy who likes to sleep as soon as the car moves! One tip we would like to share is to change nappies regularly to avoid a poonami as we call them. This is a major nappy spillage which somehow can explode all over the car seat, up bub’s back and who knows where else and it can leave you in a bit of a pickle on the side of the road (trust us!!). If travelling with a younger bub you may also become experts in the sport of ‘front seat nappy changes’ or even nappy changes on your lap – yes it can be done! Encourage your kids to get used to sleeping anywhere from an early age. Never leave a child asleep in a car unattended and always ensure there is plenty of airflow. Travelling with kids is very different to travelling alone or as a couple. We used to squeeze as much as we could out of each day, but now we have to slow it down a little and stop and smell the roses, pick them… and maybe even make a fairy garden with them! When on the road remember that everything is new and exciting for your little adventurers and it is not just about your destination but all the fun activities you can do on the way. Our little ones have taught us to appreciate the small things around us – a spider spinning its web, soldier crabs digging their holes or teaching them how to make little daisy chains. ​We always cut down long drives and stay a night or two in between our main destination. If we can, we also leave a spare seat in the back ready for someone to jump into if needed. We also plan regular stops to let the kids (and us) run off some steam. ​ Stopping every 2 hours is a good guide. Packing for a trip with young kids can be pretty tricky as you are probably used to all the mod-cons that come with your house. It is actually surprising and refreshing when you realise how much you don’t need. For our recent trip we had Ziggy, our 13 week old sleeping in his pram bassinet. This was great as it can clip in and out of the pram so we also took this to the beach with us to help shelter him from the sun and wind etc and it gave him somewhere to sleep while out and about. For Marli (2.5 yrs) we used a foam fold-out couch which was also handy as it doubled as a seat for her while camping. We also take along a storage tub which doubles as a ‘bucket bath’. If your kids are still using a high chair we recommend packing a trusty IKEA high chair. They are a little bulky but do come apart and if camping or caravanning it is great to use for not only eating, but as a play table/tray for play dough, colouring in and games etc. This worked wonders for us on our last caravan adventure. They are also great as you can clip your little one into it for safety and peace of mind around camp fires, keeping them up off the ground, away from animals, or when you need to get a few things done and don’t want them running wild around your campsite or caravan park! Marli and Ziggy (in his bassinet) enjoy the shade of a tree with our travel beach tent while I (Tracy) have some time out relaxing on the Tea Tree Lake at Lennox Head, NSW. One ‘must have’ item we love is a baby carrier. As you may know travelling with little ones can be hard especially if you have to deal with the dreaded day sleep. We like to use a MacPac child carrier (which has a proper harness) for long hikes so bubs can sit comfortably and enjoy the ride, as well as sleep (you could also take a mini pillow for them). 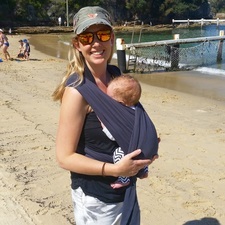 As our little one is still tiny we use a hug-a-bub wrap which can fold up nice and small in our bag, or the Ergo baby carrier for when they are a bit bigger, as bubs can be worn on your front or back by mum or dad nice and snug. Another must have is a product called PoshGrotz! This amazing waterproof playwear zips over your little one’s clothes allowing them to get down and dirty while everything stays dry and clean underneath ready to hop back in to the car or to just simply cut down on washing and countless outfit changes!! ​​We own both the pants and the onesie. I also bought them in unisex patterns so both kids will get great wear out of them. Hummus and wrap bread – no preparation needed, we simply pack these and ‘rip and dip’ the bread into the hummus. The kids love it. Muesli Cups – Grab a cup, any type of muesli (we like bircher muesli) and greek yoghurt. Mix together in a cup and voilà.. a muesli cup! This is a big hit for us! Chia Cups – these need to be made the night before. Simply whisk/mix a tablespoon of chia seeds with 1/2 cup of coconut milk into a little container with a lid and put in the fridge to set over night. You can add in loads of other things like blended/mashed banana etc but we are keeping it simple. The Chia seeds will expand and absorb the milk and be a thick jelly consistency. You can also freeze these for an ice blocks (which will keep the kids quiet and busy!!). Dry cereal to eat as a snack – we like those plain corn puffs or cheerios. (You can even create a snack necklace before your adventure with them by threading any ‘O’ cereal on to some string and tying around their neck/s). Avocado and a spoon – the novelty of giving your toddler a spoon to dig out the avocado flesh themselves will keep them quiet and busy for ages! Simply cut in half and remove the pip. Good old bananas, punnets of strawberries or blueberries (which you could also freeze) never gets old. Along with what we call ‘Apple Chips’… this is small slices of apple cut like chips. Simple! Edamame beans – steam up a batch of frozen edamame in pods and store in an airtight container (for up to three days). Before you serve them sprinkle with a touch of salt and watch the kids have a blast popping them from the shells right into their mouths. Please share with us your own travelling with kids tips below in the comments – we would love to hear from you.